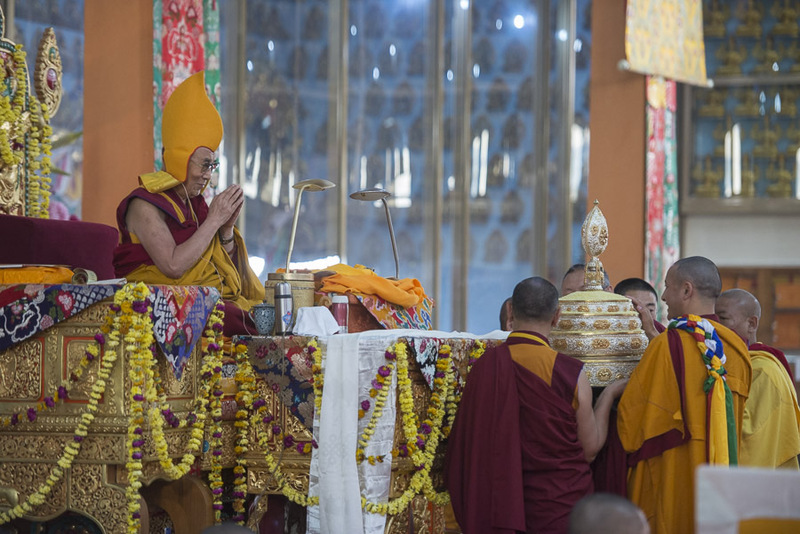 (TibetanReview.net, Dec31, 2014) – Tibet’s exiled spiritual leader, the Dalai Lama, on Dec 29 concluded a week-long series of religious teachings at Ganden Jangtse Monastery in Mundgod Tibetan Settlement, Karnataka state. Alongside the teachings there were two life-long offerings, a function to mark the 55th anniversary of his first teaching in India at Tawang, and another function by the state of Karnataka to mark his birthday every year. There were visits by state and union government ministers, besides by an ambassador. More than 25,000 people, including over 2000 from some 43 foreign countries, as well as a large number of monks from Sera, Ganden, Drepung, Tashi Lhunpo and Mindoling attended the teachings. A number of Indian Buddhists were also present. The Dalai Lama visited both the Ganden and Drepung monasteries, as well as a number of smaller monasteries in the settlement. At Drepung Gomang he inaugurated a hostel capable of accommodating some 200 of the 400 or so Mongols studying there. The Ambassador of Mongolia attended the function. On Dec 26, a ceremony was held to mark the 55th anniversary of the Dalai Lama’s first teaching in India, which had taken place at Tawang. The function was organized by the people of Mon Tawang and government of Arunachal Pradesh represented by Mr Kiren Rijiju, India’s minister of state for home affairs, and Mr Pema Khandu, Arunachal’s minister of Tourism and Water Resources. The organizers presented to the Dalai Lama a trophy in the form of a lotus image in silver. Also, the Dalai Lama launched a project by the ministry of tourism, Gov’t of Karnataka, to celebrate his birthday annually in the state. Tourism minister Mr RV Deshpande urged the Dalai Lama keep visiting the state. A Long-Life prayer offering was also made on the same day by the Drakyab Community headed by Drakyab Rinpoche, a lama with a 393-year lineage. The Dalai Lama praised the Germany-based Rinpoche, whom he had known since the latter was a child, for having given up the propitiation of Dolgyal, a controversial 17th century spirit, following his advice based on well-researched finding of it as a malevolent spirit. Another Long-Life prayer offering was made on Dec 28 by the people of Mundgod settlement, joined by people from the Dzachukha area of Tibet who had also sent a letter to the Dalai Lama. The Dalai Lama is to resume his teachings next year.